On his epic journey across the Pacific aboard a traditional balsa raft, Thor Heyerdahl and his team dined on buckets of plankton (as well as military rations, coconuts and countless species of fish, crustacean, etc.). 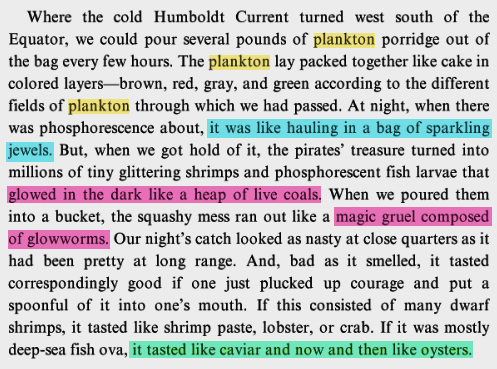 Their descriptions of drawing up the plankton tows and the experience of actually slurping the stuff down, are some of my favorite passages from the opus work The Kon-Tiki Expedition: By Raft Across the South Seas. Given the changes since these days, in terms of the encroachment of the plastisphere into the water column…I wonder if such dining will still be possible on my excursion? After reports of a smack of moon jellies temporarily shutting down a Baltic Sea nuclear power plant by clogging the plant’s cooling water intake pipes, we began to wonder if the future is now, and jellies are taking over. Then came this sweet report on “Jellyfish Armageddon” (not hyperbolic at all), complete with world map of the combat theaters, which I am obliged to repost here for its excellent use of background image. Although this is a serious issue, I have a hard time taking this as a serious analysis. I’ll keep looking for more substantive evidence of the plankton-led apocalypse, and keep you posted. You are currently viewing the archives for October, 2013 at plankton every day.